Two years ago I moved to Sixgill country. Vancouver Island is Canada’s version of Southern California; full of energy and enthusiasm. It is graced with mild winters and long warm summers, and for a few intrepid divers some very big sharks. Sixgills are huge, up to 15ft or more and built like zeppelins. Considering their tremendous size its amazing how difficult it is to find one. 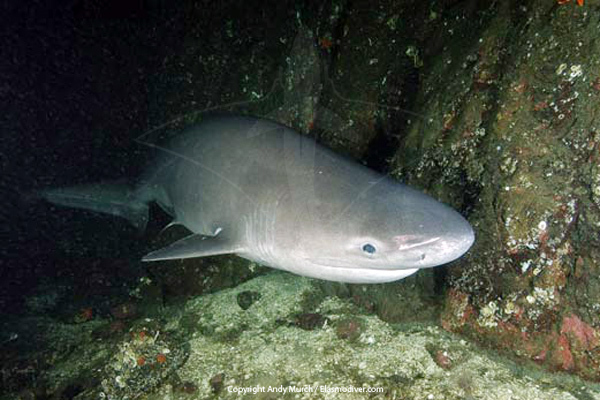 They are one of the most elusive and poorly understood shark species that a diver could ever hope to encounter. They spend the majority of their time at abyssal depths where their round luminous pupils are ideally suited to picking up the thin traces of light in their surroundings. They have been recorded at almost 2000 meters and probably hit even greater depths but in a few key places during the hotter months they venture up into diveable waters. After two years of local dives in Saanich Inlet where sporadic sightings occur, I started my search in earnest at Hornby Island. Hornby has become quite famous for its number of Sixgill sightings over the years. I eagerly signed up and spent many hours floating along the rocky undersea ledges but dive after dive I came up empty. Undeterred I went back at the next opportunity but struck out again. Meanwhile back in Saanich a sixgill had been spotted in the Inlet which is a true fjord just north of Victoria. Inspired by this news I dove obsessively ignoring my ever deepening work load and the little notes left by my family reminding me of their existence. Feeling guilty and despondent I took a day off to catch up on life and sure enough another Sixgill was spotted! The next day dawned cold and ugly, but unable to resist I slipped in for one more chance, and dropping under the plankton layer I kicked along in the darkness straining at the limit of my sight. Sinking down to 80ft I headed for a likely ledge and suddenly from nowhere I had a large shark swimming at my side. Feeling a combination of disbelief, awe, and euphoria I raced forward to compose a shot and tried desperately to stay in position ahead of the approaching giant. She swept forward eying me casually and my legs pumped away in an effort to keep pace. Oblivious to my strobes the Sixgill meandered along the rapidly narrowing ledge and then all too soon she fell away into the darkness. Now down at 130ft I looked at my computer, and remembering the nitrox depth limit kicked back to the light looking down occasionally in the hope of catching another glimpse of her. Switching back on a deeper ledge she wandered onward into her lightless world until lost in the darkness. Back at 80ft I floated along elated, willing her to return but sure that she was gone. My two year search had culminated in an encounter that could not have lasted more than a minute. But, these 60 incredible seconds made the hundreds of frustrating dives spent staring into the gloom and the endless hours of freezing decompression fade into insignificance. Sometimes the search really does make the encounter that much sweeter.